I should start by saying that these 5 myths aren’t my own discovery. 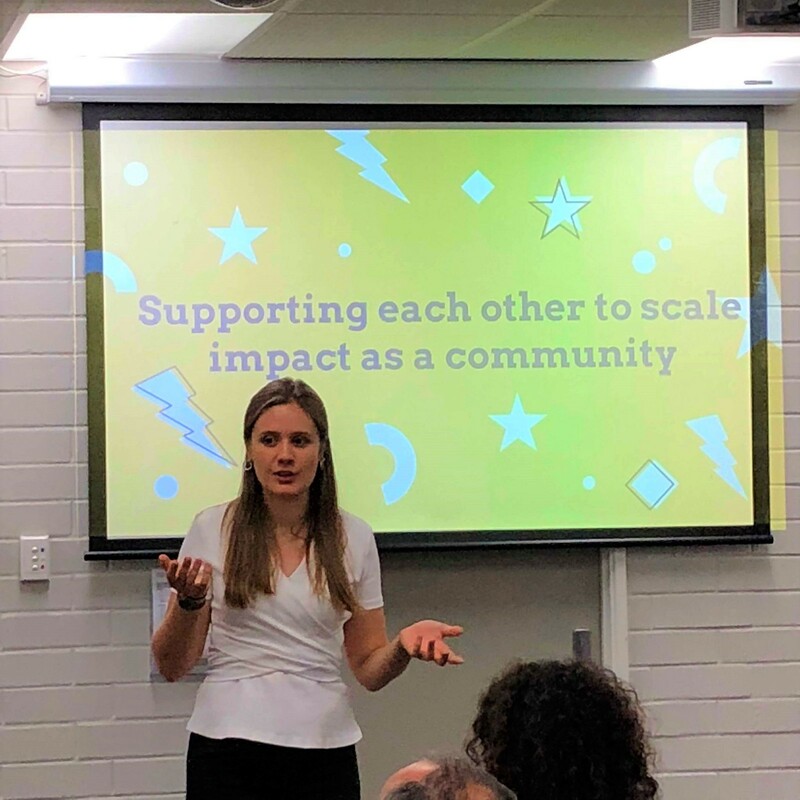 The Fogarty EDfutures community was very lucky to be joined by Sarah Dew from Innovation Unit UK (all the way from London!) at our recent community night. Innovation Unit work with everyone from schools and health care providers through to governments, to grow new solutions to complex social problems. Sarah was generous enough to share some of IU’s thinking about scaling innovations coming out of their extensive experience. Sarah Dew from Innovation Unit sharing her insights on scaling with us. 1. Scaling is about informing people. This is definitely something we’re guilty of in education — we think we can increase innovation just by telling each other about great things that are working. How much of your engagement with innovation in education is through reading (the executive summary of) the latest report? Or through listening to keynotes at conferences? There’s a persistent myth that innovations will spread if only people know about them — but that’s not the case. As Sarah affirmed for us, “evidence is not enough”. Scaling an innovation requires much more than knowing what it is and that it worked quite well somewhere else: a new community needs to adapt the idea to their own unique context, build a sense of ownership to get buy-in and traction, and be supported in actually making something happen, rather than just talking about it. 2. Innovations scale by spreading from one organisation to another. Often this is not how innovative approaches spread — instead, the new, innovative organisation takes over a larger share of the market or sector. Think Uber vs taxis: Uber’s disruptive approach hasn’t spread because taxi companies have copied it, but because they’ve outgrown and displaced much of their competition. This raises some interesting questions in education. Do we have a large, fast-growing competitor to the traditional state schooling system? (It doesn’t seem like it.) Do we need one? Is this what innovative charter schools in contexts like the US are trying to do, and is there anyone trying to do that in Australia? 3. First we innovate, then we scale. This sequential approach seems logical, but Innovation Unit’s experience suggests that ‘pilot’ followed by ‘roll-out’ is actually not a very effective way to scale. The best innovations are the ones with scaling built-in from the outset: those who engage broadly with potential adopters and are willing to be flexible to cater for the different demands of different users. Innovation Unit’s Model for Scale, which you can find here. 4. The more innovations we create, the more likely we can scale one. The power of this myth was demonstrated to me at an education conference I went to last year. The entire Melbourne Exhibition Centre was decked out with stalls advertising great new education products, programs and interventions — and many of them were indistinguishable from each other. In a sector with limited resources, we waste a lot of them duplicating effort in the hope that we’ll be the heropreneur whose idea soars to the top. Sarah’s recommendation: pay attention to demand. Be clear about what problem you’re trying to solve and make sure the people you’re solving it for are on board, and your innovation is much more likely to get to scale. 5. Scaling is done by professionals. This is maybe the key lesson that I took away as a convener of the EDfutures community: it’s not all about us! Innovation doesn’t always happen through a group of professionals sitting in a room, thinking about the problems in their sector and coming up with a great idea to solve them. In fact, the best innovations are often created and driven by users — which in our case are the kids. Where were they in that room, while we made grand plans for their education and their futures? My key takeaway, then, is that we need to bring the students into our community as much as possible, and amplify their voices, ideas and opinions. We still have a long learning journey to go on before we can create an innovative and equitable education system, but we’re going nowhere if we don’t invite the kids to come on the journey with us. If you want to know more about Innovation Unit and the amazing work they do in the UK, Australia and New Zealand, I highly recommend checking out their website. You can follow Sarah Dew on Twitter at @sarahfdew. IU founder Valerie Hannon’s book on the future of education, Thrive, is also an excellent read! Empowering young people to create better futures.